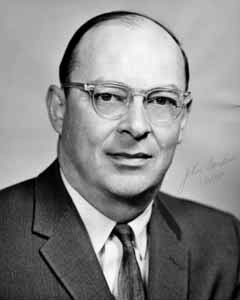 Though his name is not familiar to most people outside of technical circles, few scientists have matched the accomplishments and impact of American physicist and inventor John Bardeen. He studied under John H. van Vleck and Eugene Wigner, and came to work at Bell Labs in 1945, where in collaboration with Walter H. Brattain and William Shockley he invented the electrical transistor two years later. The transistor, of course, brought the electronics industry into the modern era, led to the development of virtually every electronic device in the modern world, and earned Bardeen, Brattain, and Shockley the Nobel Prize in 1956. Even as he accepted his Nobel honors in Stockholm, Bardeen had already begun work that would lead to his next major accomplishment, the microscopic theory of superconductivity (increased electrical conductivity in some metals when chilled to temperatures approaching absolute zero). In 1957, with post-doctoral student Leon N. Cooper and graduate student Robert Schrieffer, he developed the first workable scientific elucidation of this phenomenon. Now commonly called the BCS theory (for the trio's last names), it has had profound implications for nearly every discipline of physics, and won its authors the Nobel Prize in 1972. His other students included Nick Holonyak, developer of light-emitting diodes. He was the only person to win two Nobel Prizes in Physics. He also conducted extensive research in geophysics, the cohesion and conductivity of metals, diffusion of atoms in crystals, mine-sweeping, quasi-one-dimensional metals, radio waves, surface properties of semiconductors.